This article was published in the August 2017 issue of php[architect] magazine. You can see how it looks as part of the magazine in the Free Article PDF. Check out our subscription options to become one today. We have digital and print options starting at $4.99 per month. Setting up multiple services to share a common login without re-authenticating for every request or when switching to a different application may seem like a rather complex task at first glance. And while of course we have some things to consider, the final solution does not have to be overly complex. The basic concept of a single sign-on service—SSO for short—is to allow a user to log in (authenticate) once upon requesting the first protected URL, independent of the actual service visited, and maintain this state independent of whatever other service is being used next. When set up as a proxy, it’s the SSO’s job to ensure the user is authenticated before allowing the request to be passed on to the actual service, and to provide the application with identity information so it has a means of knowing who its user is. An SSO implies that the management of user accounts is centralized. This has quite some benefits for administrative staff, as they only have to create one user account for all applications. It also avoids the need to synchronize the login details among various platforms and taking their varying rules for passwords, user names, and other required information into account. Centralized authentication also benefits the end user: No more password changes for individual applications with different requirements, and gone is the need to remember where the password was already changed and where the old one is still valid. Because, let’s face it—not everybody adheres to the rule to not use the same password for multiple services, anyway. And of course, there’s no need to log in over and over again, just to open all the applications needed for the work day. On the other hand, relying on a single service turns authentication into a so-called single point of failure—SPoF for short. If the SSO service is not available, no login can be performed for any application. For us and from a system architectural point of view, this means the availability of the SSO server must be our highest priority when planning day-to-day operation. This seems far from being a new problem, though, and chances are, you even have or had other single point of failures already in your company or network: a shared database server, for instance, or the single uplink to the internet from your office, that one network switch or router, or even the single file server where all the documents are stored. Luckily, many possible solutions to achieve high availability already exist: From simple redundancies to fail-overs and clusters, all we need to decide is which one would fit our concrete needs best. 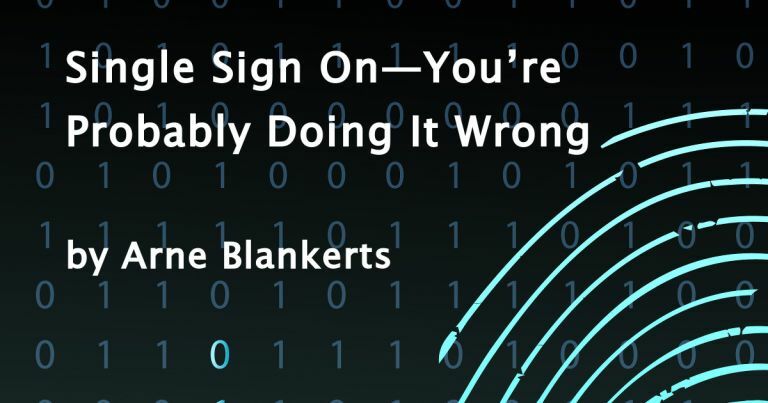 As the benefits clearly outweigh the potential problems, it’s time to finally dive into developing our single sign-on solution. Authentication, the act of verifying that a person is who she or he claims to be, is usually a prerequisite to gaining access. Such a process can be implemented in a fairly generic fashion and is well understood. Determining whether or not that person, after being authenticated, is now authorized to perform a certain action or is allowed to retrieve the requested data is a more complex task. While basic ACL (access control lists) constructs can be potentially managed in a generic fashion, more fine-grained restrictions may also be required. For example, access to a profile was granted by the ACL, but the amount of data shown varies upon the type of user. Particularly in CRUD-based applications, determining upon save which part of the profile changed and whether or not the current user was actually entitled to change that field can be quite hard as well. Trying to find a generic solution to both managing and mapping these types of permissions back into the application is likely to cause sleepless nights for everybody involved. So to not drown in complexity, the SSO should be limited to offering authentication. And maybe check whether or not the user is allowed to use the application in question to catch policy violations early on. Any additional authorization has to be delegated to the application itself. Before developing new software, it’s always a good idea to look at preexisting solutions. Maybe we don’t have to program anything? Of course there are various technical approaches to SSO, as well as many commercial solutions. When tasked to implement a “simple” SSO service themselves, many developers consider OAUTH the way to go. OAUTH aims to be an “open protocol to allow secure authorization in a simple and standard method from web, mobile, and desktop applications”. As the mission statement clearly focuses on authorization, this is likely not what we need, but let’s have a look anyway: OAUTH has been designed to enable users to grant access to functionality of the providing application to a third party without revealing the user’s credentials. A very important aspect in the design of OAUTH is that the third party software is not to be trusted, from the providing application’s perspective. Beyond the authentication itself, though, we don’t want to access any functionality of the SSO server, let alone want the user to be in control of it. As this goes conceptually in the opposite direction from where we are trying to go, OAUTH cannot be the answer. That saves us from looking into its technical aspects and we can check the next candidate. Next on the list of things Google usually returns when we’re searching for SSO and PHP is SAML—the Security Assertion Markup Language. SAML has been developed by the OASIS consortium (OASIS stands for “Organization for the Advancement of Structured Information Standards”). 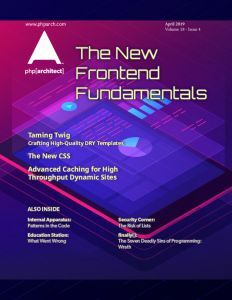 OASIS has published a broad range of standards, like the Open Document Format used by LibreOffice or the Docbook format used by the PHP Manual. SAML has been around for a while, since 2001, and is used by many big players in the enterprise market. It is a standard for exchanging authentication and authorization data between security domains. The powerful XML-based protocol uses so-called security tokens containing assertions to pass information about an end user between an identity provider and a service. It not only sounds rather complex, it comes with a lot of technical overhead if all we want is a shared login. Shouldn’t that be rather simple? Let’s take a step back and re-evaluate our problem. Technically speaking, our goal is to have multiple applications know the user is logged in and authenticated. We do not care about authorization at this point. Assuming all the applications are written in PHP and are hosted within the same network or even the same physical machine, the most basic and simple solution could be to use a shared session. Except, this does not work: As soon as there are additional application-specific values and potentially serialized objects stored within the PHP session, the idea collapses. Since by definition all data in the session is shared, every application needs to able to read and work with the given data structure. We would be restricted to scalar values if we did not want incomplete class objects to be created upon unserialization. But that’s actually the least of our problems. If we were to implement this, we’d have a serious security issue on our hands: We provided an application with the means of modifying the session state of an unrelated application! That’s a big problem and definitely a no-go. To fix that, we would need to separate the authentication information from the application session. That means we’d have to deal with two sessions in one PHP process. Sadly, the standard PHP session extension does not support that and we’d have to implement all the session handling ourselves. It might be a fun task to do but hardly qualifies as a simple solution. And sharing a session has another potential drawback: What happens if not all applications are written in PHP? All server-centric approaches failed for varied reasons, maybe we should include the browser into the game and use its ability to store information for us. Given we cannot simply trust anything stored on the client as plain text because it could be manipulated, we’d need to find a secure way to store our authentication result in the browser. One such way would be a JSON Web Token, or JWT for short. Defined in RFC 7519, JWTs are an open standard that defines a compact and self-contained way of transmitting information between two parties in the form of a JSON object. The information provided can be verified by checking a digital signature and should thus be safe from manipulation. JWTs can be signed by either using a secret within the HMAC algorithm or a public/private key pair. All the nice encryption is actually rather useless if an attacker can simply capture the network traffic and extract the token because of an unprotected transport. For this approach to work, we have to rely on HTTPS all the way. Luckily, that shouldn’t be too much of a problem, as plain HTTP is dying out anyway. The web page about JWT explicitly mentions authentication as one common usage scenario, along with single sign on. There are client implementations for pretty much every language; PHP has even various alternative solutions to choose from. Sounds good! So maybe that’s the way to go? And that’s not all: Conceptually, JWTs are like a distributed cache. When using JWT for storing authentication data on the client, the SSO server is never again bothered – that is, until the JWT expires. That’s of course by intention and makes a lot of sense for JWTs. But in case you want to change access permissions, disable an account ,or merely add new values, you’ll have to wait until the token has expired. This, along with all the parsing and signing overhead, seems again like the opposite of a simple solution. That leaves us with the idea of a user token or identifier and an API call from the application to our SSO service to get the actual user information. The process could be straightforward: Once the user has been authenticated, a user token or identifier is generated by the SSO service and stored as a regular, shared cookie on the client. Equipped with this token, the application could call an API provided by our SSO service to retrieve additional information about the current user. While the general idea of a simple session-like token to be stored on the client sounds good, the rest seems awfully like reinventing OAUTH. It also means we have to provide this additional API and define the data structures, satisfying the needs of all the applications we plan on protecting. And we have to make every application call our API to get the information. So, maybe requiring callbacks is not yet a good solution. Truly separating concerns, the protected application should be unaware of the SSO proxy setup. To achieve that, the SSO would have its own session token, as described in the last paragraph, but use a proxy approach to inject additional information for the application into the request before forwarding it. That way, the application will get what it needs without making any API calls itself and the SSO proxy would be transparently in charge of security at all times. Sounds good, but also rather complicated? Actually, it’s not, as the following examples will (finally) demonstrate. The public-facing web server—reachable at “application.example.com”—will execute the lua script access.lua to determine whether or not the request can and should be forwarded to the actual application server—named application.local in this example. It should be obvious that access to that server should be restricted to only work via the SSO proxy in front of it. The main SSO logic is implemented in the access.lua script in Listing 2. In cases where the cookie was set and there is matching data found in Redis, it will be injected into the request as an additional, custom header named X-USER-INFO. And the request will be returned to Nginx, which in turn will proxy forward it to our application at ‘application.local’. Our access.lua above relies on the UUID cookie and on Redis to hold the user details. For that to work, the user data needs to be stored in Redis and the cookie needs to be set upon successful login. The following excerpt (Listing 3) from the login demonstrates how this would roughly look like in source code. To complete the setup, we of course still need the two remaining hosts, “sso.example.com” as well as “application.local”, to be configured. Both are rather standard PHP-enabled web server setups and thus do not provide anything of real interest at this point. Examples can be found in the accompanying material to this article, for those who are interested never the less. Assuming we implement an actual authentication mechanism at sso.example.com, we now have a working single sign-on system for all applications within our domain. Sending the user details as a header is of course only one way of providing the data. You are completely free to implement whatever format suits your needs. For instance, we could enhance the lua code to create a JSON web token to be forwarded to the internal application upon login, satisfy some BASIC HTTP Auth , or emulate an LDAP or even TLS Certificate DN. Speaking of certificates: in case you want to take single sign-on one step further, you might consider avoiding the actual log-in process completely by deploying client side certificates. Unknown to many, TLS certificates can work both ways: the commonly used way a server authenticates itself to the browser but also the other way around, having a client authenticate itself to the server. For this process to work, you need to set up your own certificate authority (CA) and provide the user with a certificate signed by that authority. You could also create a registration portal and use the HTML5 form element ‘keygen’ to have the browser create a key and then sign the generated CSR. However, the development of such a portal is out of the scope of this article. If you have your CA-signed client certificate installed in the browser, you can require its use by enabling the respective functionality within NGINX with only a few changes to any TLS-enabled server configuration. See Listing 4. With the above server setup, every request must have a valid client-side certificate installed that is signed by the referenced CA. If that is not the case, the user will be redirected to the registration portal. Strictly speaking, only a proxied approach can deliver a true single sign on. Only the first request to either service is to require the user to log in, from then on all requests are already authenticated, regardless of what application is being used next. Every other solution can, of course, use a shared service for authentication but will require individual logins never the less. Whether that login is performed with a username and password or a certificate is almost an implementation detail. Whether or not the SSO solution using a proxy can work for you highly depends on your requirements and your situation at large. As always within IT, there is no perfect or a one-size-fits-all solution. You have to weigh the individual costs and benefits. For the proxy approach to work, everything needs to be routed through the proxy. While all services can have their own, individual and unique host names, due to the cookie used for tracking in the solution demonstrated here, they all have to reside within the same domain. Otherwise, the browser won’t send it along and we don’t have a generic way of setting it for other domains. what do you think about keycloak? Nice article – I have learnt a lot, and clientside certificates can be used outside of web applications as well (registering with an IMAP, SMTP or SIP server f.e.). I do wonder why the traditional SSO solution has been left out: Kerberos+LDAP? Apache has a module capable of talking to Kerberos, and I would suspect NGINX to be equally capable?